DxOMark reveals selfie camera rankings, Pixel 3 on top! Home / dxomark / mobile / news / DxOMark reveals selfie camera rankings, Pixel 3 on top! DxOMark camera labs revealed their first ever selfie camera score list. On top of the list is the Google Pixel 3! The score is generated through the DxOMark Selfie test protocol. They said that they designed this protocol to do the same tests as what they have done to smartphone main cameras for years. They want to provide a "neutral and reliable" test data about smartphone front camera performance as well as image quality. The scores will be shown side by side with the smartphone's main camera scores. 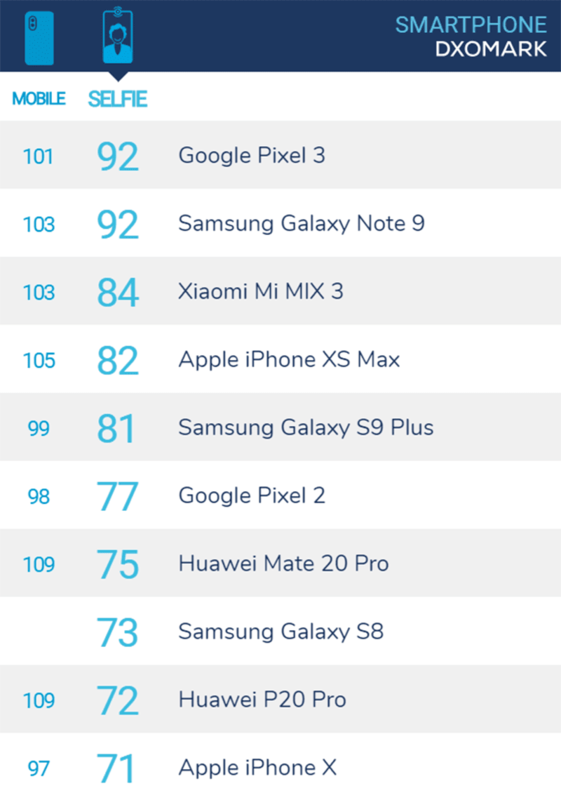 According to the list, the Google Pixel 3 and Samsung Galaxy Note 9 shares the top spot with 92 points. Next is the Xiaomi Mi Mix 3 with a score of 84, iPhone XS Max with 82, Samsung Galaxy S9 Plus with 81 and Google Pixel 2 with 77. The list is rounded up by Huawei Mate 20 Pro, Samsung Galaxy S8, Huawei P20 Pro and the iPhone X. According to DxoMark, the Google Pixel 3 showed better performance in terms of its focus system while the Galaxy Note 9 performed better for exposure and color. Images from the Pixel 3 has stronger contrast and cooler white balance while the Note 9 produced better exposed images and more natural looking. For the main camera, the top performer is the Huawei Mate 20 Pro with a score of 109 total points.